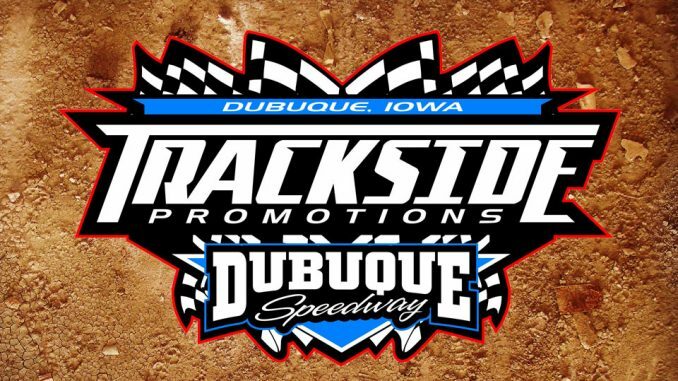 DUBUQUE, Iowa (April 15) – The new date for the Deery Brothers Summer Series show at Dubu­que Speedway is Sunday, April 28. Postponed from April 14, the main event for touring IMCA Late Mod­els pays $2,500 to win and a minimum of $300 to start and headlines the Hershel Roberts/Ray Guss Sr. Memorial program originally scheduled last Saturday at Maquoketa Speedway. The April 13 show lost to low temperatures will not be rescheduled. Also running at Dubuque will be IMCA Modifieds, IMCA Stock Cars, IMCA Sunoco Hobby Stocks and Karl Kustoms Northern SportMods for national, regional, state and track points, along with a local 4-cylinder class. Pit gates and the grandstand open at 2:30 p.m. Hot laps are at 4:30 p.m. with racing to follow. Spectator admission is $20 for adults, $18 for seniors and students and free for ages 12 and un­der. Pit passes are $30. More information is available by calling promoter Nick McCrady at 563 940-7841 and at the www.tracksidepromotionsia.com website. The 33rd annual Deery Brothers Summer Series will open with a $2,000 to win show this Saturday, April 20 at Cedar County Raceway in Tipton. Independence Motor Speedway hosts what is now the first night of a weekend doubleheader on Saturday, April 27. That evening’s feature also pays $2,000 to win.